Rising between Blackwater Creek and Wallen’s Creek, Powell mountain guards over the lands where my people have lived for more than 200 years. 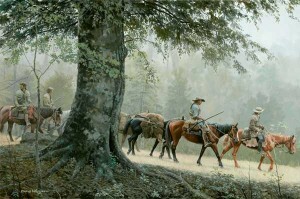 They were among the first pioneers and settlers in this area, including long hunters such as Elisha Wallen, Abraham Bledsoe, William Roberts, and Big Bill Baker. 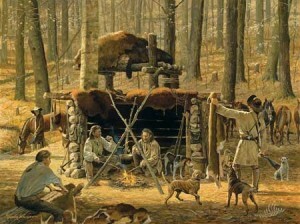 They came in search of game and settled here due to abundant natural resources such as salt and lead. Adjacent to the Cumberland Gap, this area was the first gateway to the West. Many settlers of the states of Kentucky, Ohio, Indiana, Illinois, Missouri, Kansas, Arkansas, Oklahoma, and Texas first came through here. 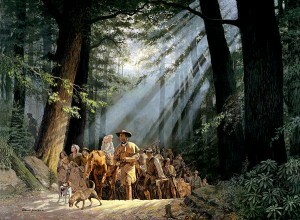 They followed the hunting paths made by the native Amerindians, who were simply following the paths made by their game. These paths ran along creeks and rivers and through valleys and eventually became the highways that wind through Kentucky, East Tennesse and Southwest Virginia. These include the “Wilderness Road” (US Highway 25), the “Daniel Boone Trail Highway” (US Highway 58), and the “Great Indian War Path” (US Highway 11). Although most of my ancestors’ stories began at Plymouth Rock, they chose to settle in the Appalachian mountains here in Southwest Virginia and Northeast Tennessee. On their journey Westward, they helped to pioneer Rhode Island, New Jersey, Pennsylvania, Virginia, North Carolina, Tennessee, Kentucky, Ohio, and Missouri. They were primarily Scots-Irish immigrants, and brought with them a stubborn, can-do attitude. I can say that the heritage that I received from them is as follows: Appreciation for hard work, stubbornness, independence, love of the outdoors, pride, patriotism, a fighting spirit, and a love for God and His Word. My parents, Foyster and Evelyn (Baker) Roberts are the seventh generation of their families to live in this beautiful area. Their home resides on AJ Osborne Highway in East Blackwater, Virginia, facing Powell Mountain. Many times they have told me the stories of our families and this area. I hope to share those stories with you. I want to thank Olonie (“O.C.”) Helton, David Baker (my uncle), Joe Wallen (my distant relative in Tennessee), and Rudy Roberts (my distant relative in Oklahoma) for the valuable research that they shared with me. I also want to thank Foyster and Evelyn Roberts (my parents), Ed and Nola Roberts (my uncle and aunt), Paul Roberts (my uncle), and Claude Baker (my grandfather) for the priceless family stories that they shared with me through the years. Sadly, some of these folks have passed on. But I look forward to seeing them and the rest of my family again when the Lord returns. I also want to thank my lovely wife, Tracy (Patton) Roberts, for introducing me to WordPress. I hope that this website is a blessing to you. Thanks for stopping by. OH MY! I’ve already made a couple of separate comments on this site. This is DE-LOVELY & the BOMB-DIGGIDY-BOMB! What a blessing you are! God will bless you & yours for taking so much time & energy to create this! Have you shared with others in our families? I found out about it through a Facebook friend just this morning, 01/26/2011!! (Would have loved to hear about it from you, my dear Jeffro! Yep, that’s the straight-forward-ness in the both of us, huh?) At any rate … I’m glad I found out about it. Again, thanks – SO MUCH! It would be great to have a family/familes reunion one of these days … this side of Heaven! The pics you posted bring back SO many fond memories. YOU NEED TO PUBLISH THIS?! My ancestor, Doswell Rogers b. 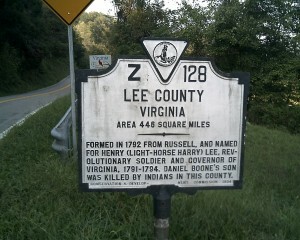 1736, traveled thru present-day Lee and Scott Cos. VA with the Roberts and Wallens. (Statement made by him in Lee Co. VA on a deposition he gave in 1812.) However, by the time they entered this area they were actually looking for land to settle and were no longer after skins. As they went along they named the creeks. The Rogers, Roberts, and Wallens intermarried for generations. They first met in Halifax/Pittsylvania Co. VA. I have traced, my family all the way from J.E. Roberts, Mathew, Nathan, then Cornelius, some speculate that James was his dad but, no know one says for sure. thanks for the site very informative. Jeff, enjoyed your website and the pictures. We are cousins, both desc of Wm and Catherine Roberts. The pic of Ed Roberts, your uncle, brought back memories as i used to stop and visit with him and Nola at the store. I grew up in Lee Co until up in my teen years and we moved to NC. Would go back home often and sometimes go thru Blackwater. Ed and Nola shared a lot of old family stories with me and pictures. Great Great Great Great Great Great Grand Parents of Cornelius Roberts[James Roberts born 1724 Deal,Kent, England and married Elizabeth Mumbray on December 27, 1748. James Roberts died in 1753. Great Great Great Great Great Great Great Grand Parents of James Roberts[Richard Roberts born 1692 Deal, Kent, England married Catherine Beech date??? Richard Roberts died 1747 in Deal,Kent, England. My GGGGrandfather was Sampson Bledsoe. I have a lot of info to share with you about the Bledsoe’s. Winder, Wright, Oren, Oris, Richard. I would love to hear from you and learn more about the Bledsoe family. Thanks! My Bledsoe line is GGGGThomas,GGGAbraham,GGallen,Gjames M. and my grandmother Amanda Bledsoe.GGGgrandmother was Millicent Wallen. johnsons of blackwater & colliers. Is there kin through your line to “Fred Roberts” of Church Hill Tn. My aunt maye lived there in a trailer house at Fred and his wife Maysie home place in church hill after she left big stone gap. She was my great aunt, being sister to my grandmother Bessie ‘collier’ johnson. Maye was a Tompkins by marriage. ?? having been trying to trace the colliers and the johnsons but hard tracking in this little known part of VA. Thanks! Hi , is this group of Roberts any kin to Aaron Roberts born 1772 in South Carolina marries a Betsy but last name is unknown to me they had at least one son John H Roberts. My grandmother was Mattie Stacy daughter of Elizabeth Wallen who was the daughter of Joseph Wallen and Susan Roberts…she married George Lawson also whose family go back to the 1700s in Blackwater area. Your selection of using crossroads as a source for Doswell Rogers genealogy is iffy. The site has numerous mistakes which you may not be aware of. Statements like Doswell served with George Washington, etc. are not factual and can be disproved from documentation which has be collected from archives, state libraries, and courthouses for the last 45 years. My father was Isaac Franklin Bledsoe, Sr. His father was Isaac Wesley Bledsoe and his mother was Sarilda Wallen Bledsoe. I know Delmer Wallen did extensive genealogical research into the family, but I was curious if anyone here had any other information. It is my understanding that my ancestors were long hunters also. Anyone infested in connecting ? i also have Baker blood because of my mother was a Baker. Love your site. I am also a descendant of William “Big Sandy” Wallen. Would love to talk to you about our shared family. Jeff, We may be on some sites together but I could not find an email for you. I just found that I have 7 matches to Cornelius Roberts on Atdna. This is a little of a surprise since I do not have direct Roberts but this indicates that I might match here. I am a Blevins descendant and one of the matches is a Blevins but the others are not and the majority were Johnson and the common denominator is Quaker. There is a strong possibility of Swift and Frost also, We are just starting today and you seem to have a good grasp on the Longhunter connections and this area. I know I have a Skaggs with possible Meredith dna connection, I am a Vaughn so sorting this out is going to be fun. I would prefer to do this by email as we are forming a small study group and I thought you might be interested. I was also wondering if you had done any DNA testing? Hi Vivian. Yes, I would be interested. My email address is jeffmrob@hotmail.com. I have not done DNA testing yet. I saw that a distant cousin’s results included middle-eastern descent(including Turkey) as well as northern European descent. the Blackwater area I thought you might be of their line. Would love help connecting Stephen Yates Sr to father John Yates III. Any information would be of great help. Thank you. Edward (Ned) Frost born 1804 in Anderson Co Tn. 1st wife Elizabeth Rogers in 1833 Tallagega Al. 2nd wife Jane Jenkins Feb. 21 1838 Morgan Co Alabama the later moved to Walker County Alabama. Eliasha Wallen was was mt 5th great grandfather. My family on the Royston side and Carder side have strong roots in upper East Tennessee. I am related to the Bledsoe Long Hunters. Abraham is my 6th ggfather. And his grandson (also Abraham) my 4th great grand married the daughter of James Carr Wallen. This is my paternal side. I also have Wallen on my maternal side. I’d love to find more information about both sides if anyone is interested in connecting with me.